IMMEDIATELY after the finish of the SKOL six-day at the Empire Pool, Wembley, the overworked voice of announcer David Duffield reached a new peak of phrenetic volume as his potful of enthusiasm boiled over when he screamed "This is the greatest 'six' I have ever seen!". Such a superlative could well have been attributed to his hard-to-disguise delight that the ultimate winners, Netherlander, Rene Pijnen and Gunter Haritz of West Germany were, at that moment, donning the colourful red track suits of their sponsors, TI Raleigh. It is no secret that the dynamo that powers the TI Raleigh participation and contribution to sport is Duffield himself. Personally, I wholeheartedly agree with his summing up and in justification for my temerity let me state what grounds I have for assuming the role of critic and raconteur of six-day racing in England. The 1975 SKOL (by courtesy of Allied Breweries) was my 17th London 'six', eight of which I have attended throughout. Without question this was the best ever and I doubt whether it could be bettered. I have made a few sorties to sixes on the continent which have led me to appreciate more fully the endeavours of our home, now well established, classic. One disadvantage the London six has to bear is its place as first on the winter calendar. This came about when there were no vacant dates when a London six could be staged and yet still be able to call upon the best riders available. With our home road programme still in-completed, one would expect this to affect attendances. Perhaps it has done in the past, but the attendance this year was an all-time record. Even the first night played to a packed house, only a few seats in the far corners being available. The 'gate' exceeded optimistic expectation to the remarkable extent that the 25p programme had to have a reprint done to cater for the last two nights. By the way, there was a last minute programme change when Leo Duyndam, the Netherlander, who has long been a London 'six' favourite went down with tonsillitis and the worthy replacement was Wolfgang Schulze of West Germany. Twenty-two riders, 11 teams, lined up to be despatched by the bulbous pulchritudinous Bunny Girls. There were three Britons, former winner (1972) Tony Gowland; the Manxman with ooddles of courage and now a fully fledged and expert rider of the boards, Nigel Dean; Reg Smith the Londoner who has been in four Skol sixes and has partnered Dean on the small tracks of Germany, Switzerland and Denmark. There were five Belgians and also five from West Germany. A pair from Australia, Graeme Gilmore (who won three sixes last winter and is no stranger to London) and Don Allan, twice in the Tour de France and spent last winter 'learning the ropes' of six-days on the continent. Of the two Danes, Ole Ritter is famed for his exploits with the world hour record but it was his first appearance before a Wembley crowd. Left Mortensen has a splendid record as a roadman (Alas! It was soon apparent that he was out of form, not having raced for four months). The five West Germans acquitted themselves well, sharing the victory with Gunter Haritz who rode at Wembley last year as a new professional. Gowland's partner Wilfried Peffgen, experienced and fit, ended in second place and the other three West Germans, 'stand-in' Wolfgang Schulze, Udo Hempel and Dieter Kemper performed well enough for there to be five West Germans in the leading six teams at the finish. The five Belgians were naturally headed by Patrick Sercu, six times a winner at Wembley and regarded, justifiably, as one of the fastest men on two wheels. Julien Stevens, Belgian motor-paced champion and once wearer of the yellow jersey in the Tour de France, Rik van Linden who took the green jersey in this years Tour de France, Ferdi Bracke, already a great favourite with Wembley crowds, and (for me) the outstanding character of the week Willy Debosscher. Willy was billed as the clown who would liven proceedings and he certainly did a lot more than that. His speed is phenomenal. I had to wait a long time before fate left him matched with Sercu in a sprint. Sercu just saved his reputation by an inch. The lone Frenchman, Sercu's partner Alain van Lancker, has ridden many times in 'our' six and has usually finished amongst the leaders. He has a record of eight wins in sixes and this promised to be the ninth but the extra spark necessary to defeat the perfectly matched combination of Pijnen/Haritz was missing. The Swiss, Rene Savary, was with us last year and was partnered by Roman Hermann of Liechtenstein. 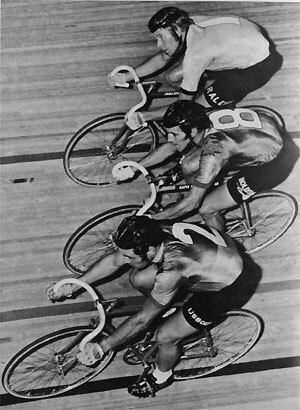 The latter's wins in amateur sixes gave promise, but the competition at the top of the 1975 SKOL gave little scope and the pair steadily dropped laps to finish 8th, 18 laps down. The Italian, Alberto Della Torte, rides sixes regularly and has won in Canada but on this occasion he proved wholly inadequate to take advantage of the great speed of his partner Belgian, Debosscher who needs a fast chaser with stamina. From the outset they lost ground in the chases at alarming rate yet always seemed to be in the picture when anything else was going on. Last year, Netherlander, Rene Pijnen, was winner of the Skol six, partnered by Patrick Sercu. Most followers of sport have their own particular 'idols'. Pijnen happens to be one of mine ever since he won a Scottish Milk Race as an amateur and was subsequently turned down by all the professional team bosses because of the many severe injuries he had incurred in his amateur racing career. They were afraid of risk 'carrying an invalid'. How wrong they were to be proved? This former Olympic champion had won 14 sixes before he added the 1975 SKOL to make his tally 15. I will not let my partisanship cloud my judgement. Pijnen and Haritz looked to me 'THE PERFECT TEAM'. As long as they stay together, barring accidents, they will stay at the top of six-day racing. I have to go back into my files to 1936 to find a comparably perfectly matched pair, Kilian and Vopel (Germany). We were not to know it at the start, but Pijnen/Haritz were to be in the lead from start to finish. They were challenged again and again but were 'Kings of the Castle' right throughout. This bald statement might indicate to the reader that it was the proverbial 'piece of cake'. Far from it. They did a most competent job throughout the week but were shadowed so closely that they could not relax their vigilance for a moment. Perhaps it is unethical to jump six (and a matinee session) days but I could here point out that at 8 p.m. on the final night, with four hours to go, there were tour teams equal in the lead lap. Home hopes were at their zenith for Tony Gowland (GB) and Wilfried Peffgen (WG) actually led having 610 points. Pijnen/Haritz with 508 points had no time to make up 100 points before the finish - it had to be a clear lap win. Sercu/Van Lancker were in the same plight with 499 points while Schulze/Ritter with only 177 points also had to win by a clear lap over the field to win. This set the scene for the frankly indescribable last Madison 'jam' of one hour which was to decide the ultimate honours. More of this fantastic struggle later, suffice it to say that Pijnen/Haritz pulled off the seemingly impossible by timing their supreme effort to a nicety, taking TWO laps without dropping into the speeding bunch for a breather. Gowland and Peffgen tried and tried to gain the essential lap but the winners were far from spent and sat on them or chased hard when it looked as though the Gowland/Peffgen bid might come off. Tony Gowland looked very tired as the last grains of sand dropped through Father Time's hour glass, he gave his all and his new partner Wilfried matched his effort but they had to settle for second place, one lap down, with Patrick Sercu and Van Lancker third at one lap. Wolfgang Schulze (having flown over just in time to replace the sick Duyndam) and Ole Ritter (in his first six) must have been quite pleased to be fourth, just one lap behind such a superb winning pair. Australian, Don Allan, who we have seen riding as an amateur in England did well with his West German colleague Udo Hempel to finish fifth a mere two laps in arrears. To Ron Webb, Australian-born organiser of all recent Skol sixes at Wembley must go the highest praise. Ron works wonders, is ever ready to innovate, experiment and widen the scope of a spectacle based on the original concept of six days and nights of continuous racing with one rider of each team on the track throughout. The old fashioned six was like the 'parson's egg' - good in parts, the jams exciting enough but there were long periods of sheer boredom. As an example I can recall being one of only two spectators (the other was the great Frank W. Southall) present at an Olympia (London) 'six' when all but two of the field crashed as they went on carrying out their contracted programme to an empty house. There is no such thing in a Ron Webb promotion. It is all "go-man-go" for five or six hours to such an extent that short intervals have to be inserted in the programme to provide spectators with relief and a chance to stretch their legs. This year Ron went one better by providing facilities for a splendidly staged Lightweight Cycle Show under the banks of seating accommodation. Just how remuneratively successful this will have proved to the many exhibitors will not reveal itself immediately, but the biggest Wembley 'gate' ever, really 'lapped up' this cycle show - thrown in free - something they would hardly have been likely, or keen enough, to travel far to see on its own. My observations indicate that with the possible exception of York Rally (and that is far north and in mid-season), the public, the users, the ones who provide the money for machines and equipment, leave cycle shows to the dealers. So successful was the show of gleaming cycleware (it occupied all one side of the track) that I predict a rare old scramble for stand space next year and those who missed out in 1975 (and regretted it) will take stands which are available on the other side of the track. This combination of a six-day and a Lightweight Show was an undoubted success and all club-folk I spoke to appreciated it. The sponsoring of individual teams by manufacturers and other 'well heeled' financially successful concerns proved another feather in the cap of the energetic Ron Webb who also seems to have a flair for finding advertising agencies avid to take up every inch of space around the top of the track.